This section is dedicated to my grandfather, Joseph A. Menting. My grandfather was a family man, veteran, and of course a loving grandfather. He married relatively late in life, in his late thirties, which though common now, was not back in the 1930's. When I was born, he was already in his sixties. I remember watching ball games with him, listening to his advice, and of course, listening to his stories. When he passed, I was in my early twenties. I remember one day sitting with my nanny after his passing, and seeing him playing the guitar. I was shocked. I never knew he played. In the later part of his life, he suffered from parkinsons disease, so he had given the guitar to my uncle Reid, since he could no longer play. Thinking back, I remember my grandfather tapping to tunes on the radio, even walking almost to a beat, but I put this off to his years in the service. About two years ago my uncle passed his guitar to me...here are the pictures. 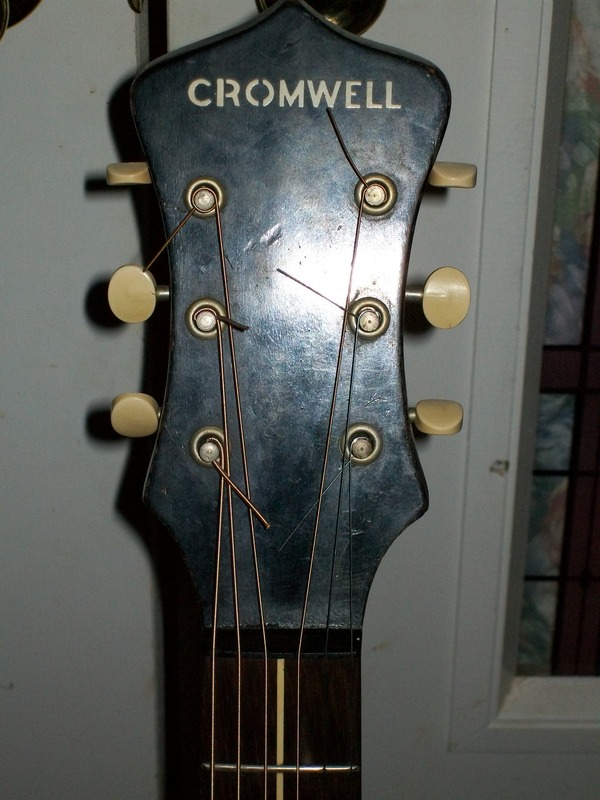 This is a 1935 Cromwell, made by Gibson for the New York Music Company. 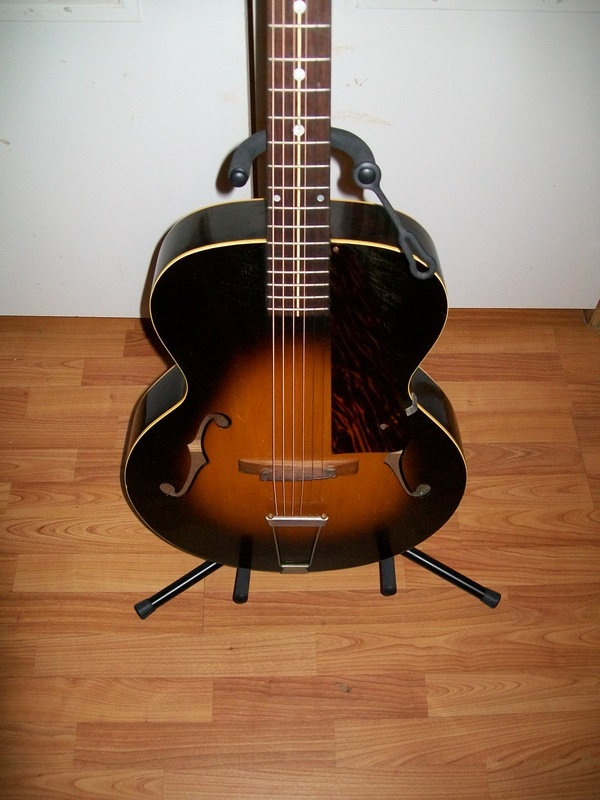 The guitar has a warm, resonant sound, 17 inches across the lower bout. The neck on this is unusual, there is a bone insert that runs the length of the neck. 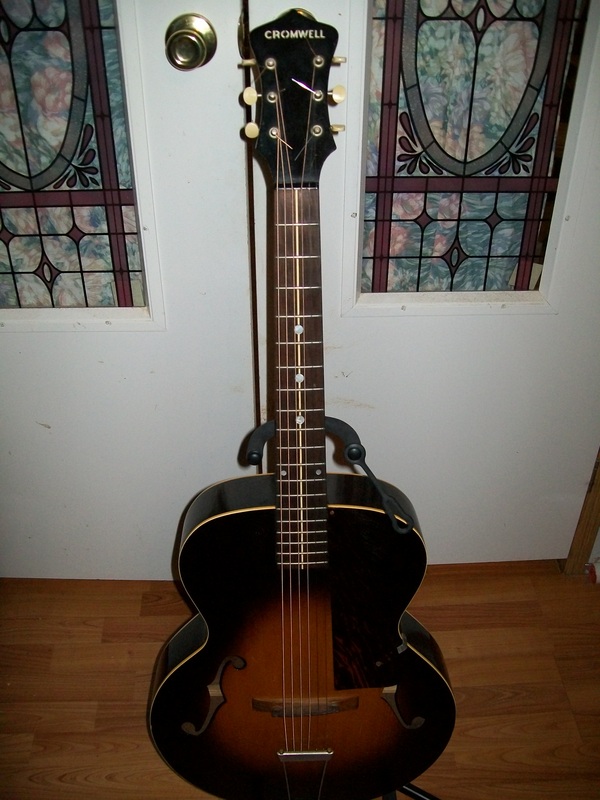 The fingerboard is either ebony or ebonized rosewood. The sides and back are pressed mahogany. She shows very little sign of age, stays in tune, and is as comfortable as an old pair of shoes. One day, another set of hands will hold this guitar, the fourth generation of my family to do so. My Grandfather must be smiling. I'd like to thank my uncle Reid as well. I know this guitar meant as much to him as it does to me. My uncle is the one that got me interested in music. Ive always looked up to him as an older brother, and he has always treated me like an adult. I remember staying at his house as a kid, and he'd break out the guitars and amps and "Proud Mary" would fill the air. Without him, the inspiration for this site wouldnt be there.